Taking it to the Grave: Glamdrew's Living Funeral at aceartinc. I’m running a few minutes behind, trying desperately to find a parking spot. I feel anxious and excited. This second emotion doesn’t feel right for a funeral. But nothing about Andrew Henderson’s living funeral performance piece, Taking it to the Grave, smacks of the ordinary. I meet Andrew (aka Glamdrew) and a small group of close friends just outside of aceartinc. Fellow photographer Adam Kelly, who’s agreed to shoot a combination of video and still images for the night, joins us. We exchange pleasantries and head inside. 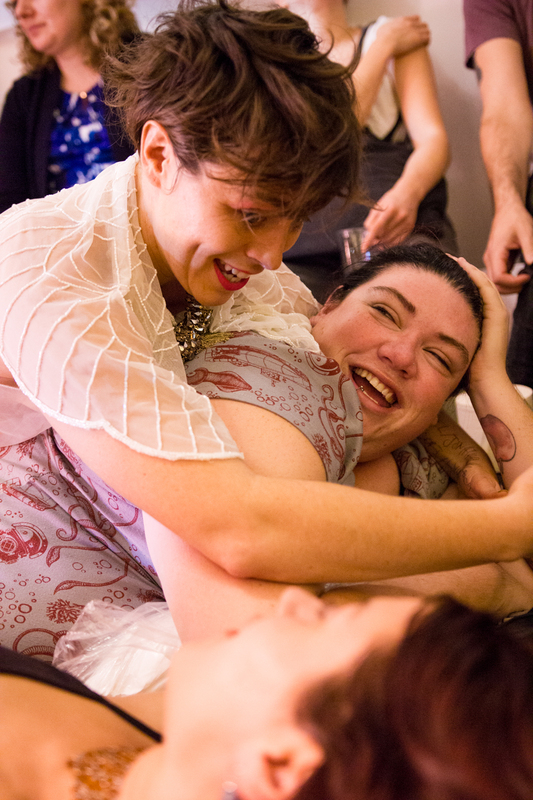 Eroca Nicols, choreographer and author of sister show, Truthteller, pulls me and Adam aside. “Whatever anyone tells you to do, just do it. Things are going to get weird in there. If it seems intense, it’s because it is,” she tells us. Eroca tours us through the performance area, curtained off from the main gallery in the front entrance of Ace, then she leads us to the Cartae space. Tonight, it’s serving as bar and reception. Audience members, friends and family fill the cramped, warm room while Adam and I quietly get ourselves sorted: checking lenses, adjusting settings, loading SD cards. Aside from a few brief exchanges about gear, we sit in virtual silence. I’m simultaneously trying to clear my mind and pay attention to my surroundings. The manifestations of grief are palpable and intriguing. The young woman running the bar's hands are shaking. When she’s not gingerly pouring out glasses of wine, they tremble behind her back. Some sit quietly, others talk and laugh as if we were at any other social event. Old friends from out of town catch up. Eroca enters and stands on a chair in white jeans and a sheer, beaded top. She explains how the night will unfold. She leads us into Ace, where Glamdrew lounges shirtless, dressed in white, wearing a glittering gold cat-eye mask and makeup. He’s spread out on a beige chaise crowned by a tule champagne bottle topper, encircled by an alter of objects: candles, cloth roses, glittering tchotchkes, a Roman bust, a framed photo of Kim Kardashian. To his right, a shroud of green fabric ghosts dangle above floor pillows, inviting guests to relax and take cover. Dance music throbs through the speakers. There’s gold everywhere. People crowd in, finding seats on the floor, in the formal seating area in front of Glamdrew, hidden amongst the dangling green ghosts. The performance begins. Eroca sweeps gold glitter inside a diamond demarcated by tape between Glamdrew and the audience. She invites us to join her. Behind her, Glamdrew waits for people to approach. They come forward one-by-one to say goodbye, chat, joke, and sob. Each audience member is invited to confide a regret or secret to Glamdrew. Then Glamdrew, the individual, and tattoo artist Carly Boyce will agree upon a symbol to represent the regret. Glamdrew then has these symbols tattooed on his body: Carly on one side with her stick-n-poke, the mourner on the other. Over the course of a few hours, I’m showered by glitter while friends dance together, I exchange words of comfort, make small talk at the manicure bar, dance and sing along to Madonna’s “Like A Prayer.” Camera at the ready, I crouch inches away from family members saying goodbye. At one point, I take a break, crossing back into Cartae for a drink of water. Alone and up against a wall, I do a hand stand. I don’t know why. 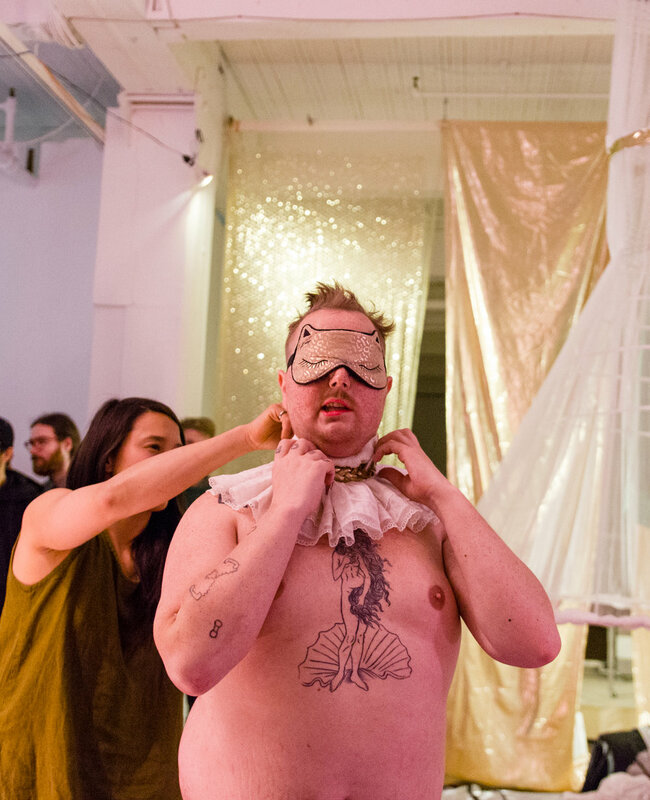 As the performance draws to a close, Eroca showers Glamdrew in champagne while he stands in a kiddie pool, then she invites audience members forward to pour water over him. The audience, Adam and I flow out and back to Cartae. We pack our gear and say goodbyes. Glamdrew’s sitting on a futon, surrounded by a handful of family and friends. His mother asks how he’s feeling. He replies, “Like my head’s about to fall off.” These words are met with hugs and hand squeezing. Before we leave, I thank Glamdrew for allowing me to photograph his night. He smiles and thanks me. Adam and I make our way down the creaking steps of the Glengarry Building; adrenaline is still coursing through my veins. Out on the street in the cool night air, I breath deeply and turn to Adam. “What do you want to do now?” I ask. Neither of us can stop grinning. This has not been your ordinary funeral. Andrew Henderson passed days after his Taking it to the Grave performance. In lieu of flowers, express condolences by supporting the Two-Spirited People of Manitoba.